Professional photography services can be expensive, partly because the equipment is expensive and partly because training to master the use of that equipment is expensive. While DSLRs are powered by advanced electronics, much of the necessary equipment is mechanical. And traditional cameras are mechanical. 3D printing can handle mechanical. Printing photography equipment is significantly more affordable than buying it. Saving money on equipment allows photographers to have more equipment, which then allows them to expand their technique portfolio. This in turn makes them more competitive with photographers that have spent more money on their rigs, because photographers with printed equipment can charge less as they didn’t go in debt over it. Clients end up saving money because they can choose cheaper photographers armed with printed equipment. Kapsones are 3D printed lens hoods. They’re essentially “jewelry for cameras” produced by Ultimakers. Currently there are four styles that can be had in several colors. They’re printed to order to fit clients’ specific cameras, and if yours isn’t listed let them know; compatibility will be expanded as demand is expressed. The same goes for styles. Pinhole is a project to create an easy to use, durable, 3D printable pinhole camera called Flyer. “It takes a 6cm x 6cm square image, 12 exposures to a roll of 120 film, just like a Hasselblad. It can be mounted to a tripod and it has a flip shutter that is really easy to use. The field of view is 70 degrees with an f/stop of 133.” 35 iterations were printed on a Solidoodle 3 to get to the current version. A kit is $29 and the STLs are $20. Or you could print a pinhole camera for free with STLs from Thingiverse by checking out my photography collection. 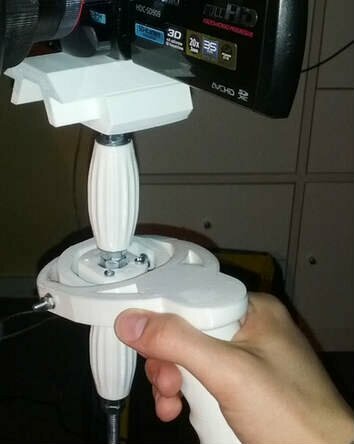 There are several on Thingiverse, as well as a lot of other fancy equipment like gimbels, stabilizers, dollies, mounts, and lens adapters. I especially like this glidecam called MaxGlide.